We’ve seen the sad fate of many family pets in recent tragedies such as Hurricane Katrina and the Haiti earthquake. During disasters, many pets become lost, scared and separated from their families. Animal shelters, when available at all, quickly become overfilled and locating and/or identifying a pet can become a huge concern. The recent devastation from the Japan earthquake and tsunami served as yet another reminder to consider our own pet emergency preparedness. Make sure your pets wear an identifying tag with your mobile phone number and consider a microchip. Keep a photo of yourself with your pet to help identify or claim him. A crate is a necessity for cats and other small animals; big dogs might be ok on leash, but the safety and warmth of a crate can be a comfort. Consider a soft-sided crate for easy transport. Where can your dog go? Prepare a list of family, friends and neighbors who would care for your animals in the event of emergency. Make sure they have your contact information, your pet’s bio, and a list of alternatives for pet care. Print a list of nearby boarding facilities and pet-friendly hotels (http://www.1clickpethotels.com/oregon.htm). Compile the following checklist (left), give copies to all emergency contacts, and seal a copy in a plastic bag and place in your Pet-To-Go Bag and/or attach it to your pet’s crate. Jill Tonkin is a Certified Dog Trainer and Canine Behavior Specialist and owner of Best Behavior Dog Services. She uses reward-based training to create a positive and healthy bond between canines and their humans. Jill offers group classes at Clackamas County Dog Services and private training throughout greater Portland. Contact her at 503-860-0450 or j.dogworthy@ yahoo.com. 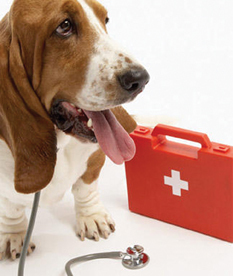 Posted in Life with Pets, Safety and tagged with Emergency Preparedness, First Aid. April 1, 2011 by Jill Tonkin - Spot Magazine.